Catalyst is a moving island functioning as a kitchen. Catalyst raises activities of a kitchen and a dining room - cooking, eating, drinking, talking, watching, and listening - in bedrooms, a living room and a garden. It attracts people and makes them react. Where Catalyst is set is the place a family comes together. Every space at home has possibility to be a family community space. We expect different events which the family asks in different spaces. This is role of the moving island, Catalyst. It does not occupy the space which it is located in. “Catalyst is a catalyst” as revives the relationship of people. “There is no Catalyst but people.” The transparent appearance conceals itself in reflecting and permeating where it is located. This transparent Catalyst informs a user what is contained and what a user wants to know. The surface of Catalyst expresses information. The other part of Catalyst, a kitchen cabinet located in one whole wall is also a screen as the surface of information. It also contains appliances and multi media. Combined Catalyst can park into the kitchen cabinet for saving space. The cabinet is not a kitchen. That is what Catalyst just left other functions that need enough space and serve Catalyst. The form is inspired by ice as a natural form instead of an artificial shape. Transparency of the ice also associates lightness of floating. The activities of a kitchen are realized in five layers - light, wind, fire, water and ice. The core of water and electronic installation is set inside of a vertical frame, which can be rolled up in a ceiling when Catalyst is moving and connects Catalyst with a rail on the ceiling. The rail functions as a track for Catalyst moving, lighting space and installations passing through. Assemblies of Catalyst are adjustable fitting suitable height to a user. The cover of a sink comes down and then becomes a table. This is a flexibility of Catalyst. Catalyst creates a convergence space and becomes a convergence appliance and furniture. This is the kitchen of tomorrow that we suggest. A kitchen must do its primary job well but it must also have the aspirational qualities associated with owning a sports car. 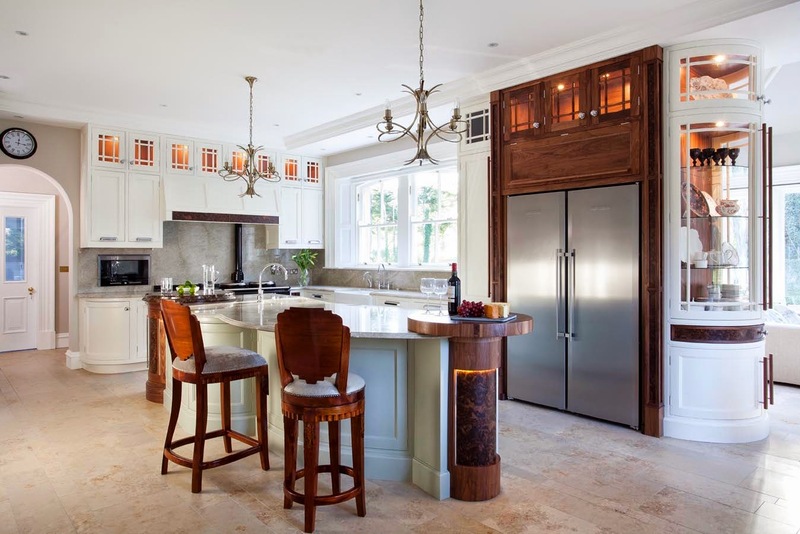 With more people spending a larger proportion of their disposable income on their dream kitchen it is fair to say that the kitchen can be a functional expression of wealth. A kitchen designed by a particular person or manufactured by a particular company can be seen as an investment and for some it can mean acceptance in social circles. In starting any design consideration must be given to who the end user will be and how the space will be used. This may involve meal preparation analysis as some people like to eat on the run while others like to prepare gastronomic master pieces for multiple guests. The demographics of the family unit also play a key part in the formation of a design as there may be multiple users of all ages using the kitchen at different times of the day to do all sorts of things. In the beginning God created the heaven and the earth...and the kitchen! The primary function of the kitchen stretches back to the dawn of humanity when primitive communities gathered around simple fires to consume the spoils of their hunt. Throughout the millennia the basic need to prepare and eat food encouraged the development of a cooking space we now call the kitchen. The development of the kitchen also had an impact on the evolutionary development of our species creating a sense of community or family and encouraging the development of social skills. The activities undertaken in the very first kitchens helped to cement the norms and values of the modern society we live in today. The modern designer must not forget the history of the kitchen or its primary function as delivering function is the basic ingredient to any successful design. There is no point in designing something beautiful if it doesn’t work very well. Thankfully the procedures and appliances used to prepare our meals have become much more sophisticated and our ingredients are now more sanitised, collected from well lit supermarket isles, but the basic function of the kitchen remains the same. It is used to prepare and eat meals but it is also a space were family bonds are re-enforced through conversation and social interaction. In today’s high speed society consideration must be given to the complexity of the new age of kitchen user who comes from a rich melting pot of cultural and social backgrounds. Kitchen design is becoming more and more scientific with many good designers adding sociology and architecture to their list of essential reading. These disciplines can assit our understanding of each individual client enabling the design to be perfectly tailored to their lifestyle. By having an appreciation of the surrounding architecture we can complement the room amplifying the creative direction the architect has expressed through their design.